Nathaniel Davis married Mary Stevens. Nathaniel Davis was born on 22 September 1777. He died on 18 April 1857 at Gilford, Belknap, New Hampshire, at age 79. Name Variation Mary Stevens was also known as Polly. Married Name Her married name was Davis. Mary Stevens married Nathaniel Davis. Mary Stevens was born on 27 October 1782. She died on 5 June 1815 at age 32. Married Name before 1863 As of before 1863,her married name was Kayser. Married Name before 1875 As of before 1875,her married name was Scheffler. Anne (?) was born circa 1839 at Bavaria, Germany. She married (?) Kayser before 1863. Anne (?) married Robert Scheffler before 1875. (?) Kayser was born at Germany. He married Anne (?) before 1863. (?) Kayser died before 1875. Robert Scheffler was born circa 1839 at Saxony, Germany. He married Anne (?) before 1875. Gustav Bluemke was born circa 1859 at Germany. He married Wilhelmina (?) before 1880. [S245] U.S. Federal Census 1900 U.S. Federal Census, by Ancestry.com, ED94. Married Name before 1880 As of before 1880,her married name was Bluemke. Wilhelmina (?) was born circa 1858 at Germany. She married Gustav Bluemke before 1880. Gustave Julius Rosenthal was born on 3 April 1856 at Wisconsin. He was the son of August Rosenthal and Henriette (?). Gustave Julius Rosenthal married Paulina Bertha Collies, daughter of August Ferdinand Collies and Pauline Reiker, on 22 April 1878 at Reedsburg, Sauk, Wisconsin. Gustave Julius Rosenthal died on 5 December 1921 at age 65. [S214] Wisconsin Sauk Co Cemetery Records Vol 9, page 140. [S246] U.S. Federal Census 1880 U.S. Federal Census, by Ancestry.com, NA Film Number T9-1446 Page Number 212D. Name Variation Paulina Bertha Collies was also known as Collice. Name Variation Paulina Bertha Collies was also known as Pauline M.
Name Variation Paulina Bertha Collies was also known as B. Name Variation Paulina Bertha Collies was also known as Collis. Name Variation Paulina Bertha Collies was also known as Lena. Married Name 22 April 1878 As of 22 April 1878,her married name was Rosenthal. Paulina Bertha Collies was born on 17 September 1860 at Winfield, Sauk, Wisconsin. She was the daughter of August Ferdinand Collies and Pauline Reiker. Paulina Bertha Collies married Gustave Julius Rosenthal, son of August Rosenthal and Henriette (? ), on 22 April 1878 at Reedsburg, Sauk, Wisconsin. Paulina Bertha Collies died on 29 February 1948 at age 87. Name Variation Anna Marie Matilda Rosenthal was also known as Ann. Married Name 17 August 1910 As of 17 August 1910,her married name was Roper. Anna Marie Matilda Rosenthal was born on 4 January 1880 at Reedsburg, Sauk, Wisconsin. She was the daughter of Gustave Julius Rosenthal and Paulina Bertha Collies. Anna Marie Matilda Rosenthal married Albert E. Roper, son of William Roper and Dorothea Schearwater, on 17 August 1910. Anna Marie Matilda Rosenthal died on 26 December 1980 at Baraboo, Sauk, Wisconsin, at age 100. [S214] Wisconsin Sauk Co Cemetery Records Vol 9, page 133. Name Variation August Ferdinand Collies was also known as Collis. August Ferdinand Collies was born on 9 November 1827 at Prussia, Germany. He was the son of Godfred Collies and Henrietta Schrank. August Ferdinand Collies married Pauline Reiker in February 1852 at Prussia. August Ferdinand Collies died on 29 November 1909 at Dellona, Sauk, Wisconsin, at age 82. Name Variation Pauline Reiker was also known as Paulina. Name Variation Pauline Reiker was also known as Roecker. Married Name February 1852 As of February 1852,her married name was Collies. Married Name February 1852 As of February 1852,her married name was Collis. Pauline Reiker was born on 14 September 1830 at Prussia, Germany, also reported as Sep 1829. She married August Ferdinand Collies, son of Godfred Collies and Henrietta Schrank, in February 1852 at Prussia. Pauline Reiker died after 1900. Name Variation Frederick Collis was also known as Fred. Name Variation Frederick Collis was also known as Collies. Frederick Collis was born in May 1864 at Wisconsin. He was the son of August Ferdinand Collies and Pauline Reiker. Frederick Collis married Thrary (?) circa 1892. Name Variation Ida Marie Louise Collis was also known as Collice. Name Variation Ida Marie Louise Collis was also known as Collies. Married Name 17 December 1886 As of 17 December 1886,her married name was Rosenthal. Ida Marie Louise Collis was born on 17 December 1866 at Sauk, Wisconsin. Ida Marie Louise Collis married John Dietrich Rosenthal, son of Charles L. Rosenthal and Dorathea Schweke, on 17 December 1886 at Reedsburg, Sauk, Wisconsin. Ida Marie Louise Collis died on 10 September 1942 at age 75. [S214] Wisconsin Sauk Co Cemetery Records Vol 9, page 114. John M. Collies was born on 20 January 1869 at Wisconsin. John M. Collies married unknown (?) before 1893. John M. Collies married Bertha Wilhelmina Henrietta Viebranz, daughter of Carl Viebranz and Albertine Zibell, on 10 May 1894. John M. Collies died on 10 September 1948 at age 79. Married Name Her married name was Kreofsky. Married Name Her married name was Krizlaky. Married Name Her married name was Kriofsky. Mary (?) married Robert Krizlaky. Mary (?) was born in 1858 at Hamburg, Germany, also reported as circa 1852. She was buried in 1899 at Oak Hill Cemetery (North Freedom Cemetery), North Freedom, Sauk, Wisconsin. Name Variation Frieda Franzisca Kreofsky was also known as Krizlaky. Name Variation Frieda Franzisca Kreofsky was also known as Kriofsky. Married Name Her married name was Getschman. Frieda Franzisca Kreofsky was born on 5 July 1876 at Wisconsin. She was the daughter of Robert Krizlaky and Mary (?). Frieda Franzisca Kreofsky married Julius Gottlieb Getschman before 1898. Frieda Franzisca Kreofsky died on 28 December 1898 at age 22. Willie Krizlaky was born circa 1879 at Wisconsin. He was the son of Robert Krizlaky and Mary (?). Name Variation Barbara Degitz was also known as Dagitz. Married Name Her married name was Kasparie. Barbara Degitz married Henry Edward Casparie, son of Henry Casperie and Anna C. Frehen. Barbara Degitz was born in 1868 at Bavaria, Germany. She was the daughter of Valentine Degitz and Anna M. (?). Barbara Degitz was buried in 1960 at Melrose Abbey Memorial Park, Anaheim, Orange, California. [S246] U.S. Federal Census 1880 U.S. Federal Census, by Ancestry.com, Family History Library Film 1254175 Page Number 478D. Name Variation Hollister Arthur Casparie was also known as Kasparie. Name Variation Hollister Arthur Casparie was also known as Howard Jack. Hollister Arthur Casparie was born on 11 March 1896 at Quincy, Adams, Illinois. He was the son of Henry Edward Casparie and Barbara Degitz. 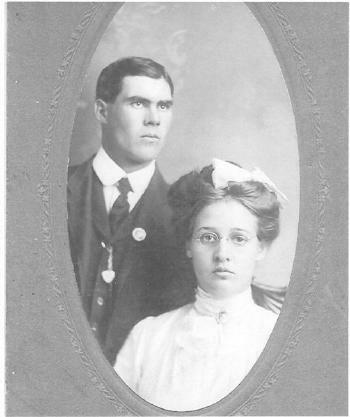 Hollister Arthur Casparie married Bernadine Adeline Schmitt on 8 September 1915 at Palmyra, Marion, Missouri. Hollister Arthur Casparie obtained US Social Security Card at California; last residence Placer, California. Married Name 8 September 1915 As of 8 September 1915,her married name was Kasparie. Married Name 8 September 1915 As of 8 September 1915,her married name was Casparie. Bernadine Adeline Schmitt was born on 6 May 1899 at Quincy, Adams, Illinois. She married Hollister Arthur Casparie, son of Henry Edward Casparie and Barbara Degitz, on 8 September 1915 at Palmyra, Marion, Missouri. Bernadine Adeline Schmitt obtained US Social Security Card; as reported by California Death Index. Name Variation George Fredrick Casparie was also known as Kasparie. George Fredrick Casparie obtained US Social Security Card; as reported by California Death Index. Valentine Degitz married Anna M. (?). Valentine Degitz was born circa 1845 at Bavaria, Germany. Valentine Degitz was a works in saw mill in 1880. Married Name Her married name was Degitz. Anna M. (?) married Valentine Degitz. Anna M. (?) was born circa 1847 at Bavaria, Germany. George Degitz was born circa 1878 at Illinois. He was the son of Valentine Degitz and Anna M. (?). Married Name Her married name was Casparie. Anna H. (?) married Charles Otto Casparie, son of Henry Casperie and Anna C. Frehen. Anna H. (?) was born circa 1864. 1930 Adams, Illinois Anna H. (?) was listed in Charles Otto Casparie's household on the 1930 Census at Adams, Illinois. Alvin Melser married Elizabeth Ivins. Alvin Melser was born on 18 July 1844 at Indiana. He died on 15 November 1893 at Benton, Minnesota, at age 49. [S246] U.S. Federal Census 1880 U.S. Federal Census, by Ancestry.com, NA Film Number T9-0757 Page Number 563C. Married Name Her married name was Melser. Elizabeth Ivins married Alvin Melser. Elizabeth Ivins was born on 13 April 1837 at Ohio. She died on 20 February 1894 at age 56. Name Variation Elmer Ellsworth Melser was also known as E. E.
Elmer Ellsworth Melser was born in September 1863 at Indiana also reported as Michigan. He was the son of Alvin Melser and Elizabeth Ivins. Elmer Ellsworth Melser married Hattie McIntire, daughter of Mahlon McIntire and Mary Moore, circa 1892. Elmer Ellsworth Melser married May (?) circa 1899. Elmer Ellsworth Melser and May (?) were divorced before 1910. Elmer Ellsworth Melser died on 25 December 1932 at Charles Mix, South Dakota, at age 69. 1910 Geddes Ward 2, Charles Mix, South Dakota He was listed as a boarder with the James Hermanek family on the 1910 Census at Geddes Ward 2, Charles Mix, South Dakota. 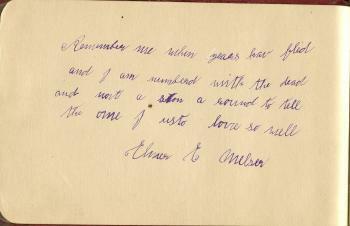 Elmer Melser memory book entry for Alice Ewing. [S245] U.S. Federal Census 1900 U.S. Federal Census, by Ancestry.com, Year: 1900; Census Place: Grandview, Douglas, South Dakota; Roll: T623_ 1549; Page: 5B; Enumeration District: 139. [S250] U.S. Federal Census 1930 U.S. Federal Census, by Ancestry.com, Year: 1930; Census Place: Jackson, Charles Mix, South Dakota; Roll: 2220; Page: 3A; Enumeration District: 13; Image: 272.0. Alice M. Melser was born on 18 March 1875 at Nebraska. She was the daughter of Alvin Melser and Elizabeth Ivins. Alice M. Melser died in December 1941 at Stearns, Minnesota, at age 66.